Kakapo, Strigops habroptilus, is the only flightless and nocturnal (most active at night) parrot. This unusual, solitary bird is from rainforests and grasslands of New Zealand. To keep other kakapos out of their territory, they make a ‘skraaarking’ sound. The kakapo has a life span of about 60 years. The kakapo had no natural enemies on its native islands of New Zealand. Although once plentiful, there are now far fewer than 100 kakapo remaining in New Zealand; it is a critically endangered species. Their decline is mostly from predatory animals (like cats, dogs, stoats, ferrets, and rats) that settlers brought with them to New Zealand. The kakapo was also eaten by Maori and European settlers. 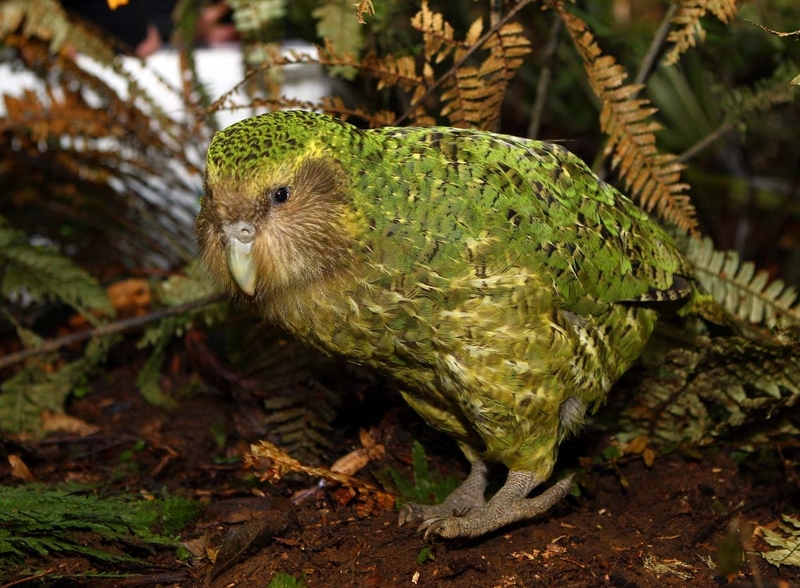 Kakapo means ‘night parrot’ in the Maori language. The kakapo is the heaviest parrot in the world; it weighs up to 8.8 pounds (4 kilograms). It is up to about 2 feet (60 cm) long. Males are bigger than females. This bird’s soft green feathers camouflage it in its leafy environment. The kakapo has sturdy legs and small wings that are only used to glide from trees. It walks with its head close to the ground. The face is owl-like.